Every band should get off to a great start. At least most every band wishes they could. 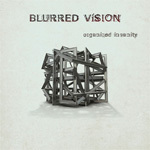 Maybe even the push that Canadian trio Blurred Vision has been getting for their debut album, Organized Insanity. UK's Prog Magazine is already declaring the album "one of the best of 2015." 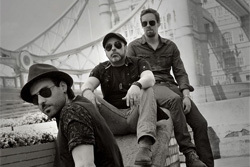 Even dentally challenged music writer Malcolm Dome has been singing their praises, already calling them an "iconic band." There's more. Ten years earlier, Roger Waters, yeah, that Roger Waters was quick to give the band his blessing. Perhaps, with those endorsements, there's not much more to say. Moreover, if Blurred Vision is this ubiquitous already, you may have heard of them and formed an opinion about their music or, at the very least, bought the album (which I hope you do). Add these together, and I suspect whatever I say really doesn't matter one bit. But have you ever known me to shut up that quickly? Okay. Just in case you've been living under the proverbial rock, and haven't heard of Blurred Vision, here's some thoughts. 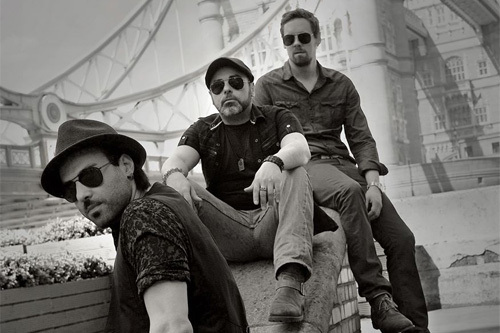 The Canadian trio plays what could be consider melodic progressive rock in a power pop wrapper. They write catchy tunes big on harmony and melody, twists in lyrical phrasing and arrangements, and puffed up with some nice guitar work. If I would invoke some comparisons they remind me of The Beatles meeting Pink Floyd, maybe with some Foo Fighters and Goo Goo Dolls thrown in. It's a stretch I know. They're lyrical themes revolve around the chaos in their personal relationships, but also the world in religion, politics, and the music scene. Ergo the title, Organized Insanity. Of the songs, my first impression, and probably second, was that they were largely uneven. No More War starts the album, a bouncy pop number which loads up a saxophone in the latter third. It's quirky, but a lively start. The next three songs, Rollin' On, Tonight, Long May You Run, totally mellow out being slow, sullen, nearly plodding. It's stark contrast to the start. Then Promise turns the corner with a gaggle of sharp guitar riffs. Not so much because it's about John Lennon, but Dear John will definitely remind you of The Beatles' later years. The melody is exquisite, the chorus pure harmonic magic. With this song, you discover you truly turned the corner on this album, the latter half is definitely more lively and interesting than the front. The guitar rises and becomes more prominent, the vocal harmonies continue to persuade, and the arrangements more dramatic. The Keeper and Organized Insanity stand out because of all three things, but caught my interest for Sepp Osley's guitar lines. While I'm not ready to go Malcom Dome gaga over this album, drolling through my crooked teeth, Organized Insanity is, though uneven at times, an interesting and entertaining listen, and the promise of great things to come from Blurred Vision.